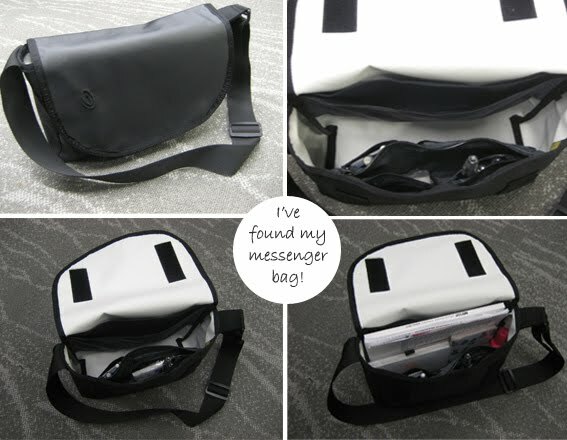 Well I'm very happy to report that I've finally found my messenger bag and ditched my annoying purse. That sad hobo sack kept slipping off my shoulder and became a black hole whenever I needed to find something in it (I can't tell you how many times I've had to practically dump the whole thing onto some store counter in search of money/cards/ID/what have you). So after searching high and low for a bag that was sleek, comfortable and big enough to hold my papers and laptop (if need be), but not too giant for my small stature, I went for the Timbuk2 Custom Eula Tote. I'd already done some research on the brand for work and after A. suggested that I get one for myself, I kept seeing their messenger bags eeeverywhere. For starters, the size fell right within the range I needed: my 11" iBook fits comfortably and the bag holds letter-sized papers, magazines and notebooks with room to spare. As with most Timbuk2 bags, you can customize this one by choosing what colors, fabrics and extra accessories you'd like for your new baby. I went with a simple black fabric-backed tarpaulin outer with a contrasting white liner. Both are waterproof (perfect for the current conditions around here), but you can also choose from basic, lightweight and patterned fabrics. As for my white interior, well, I was just tired of throwing my things into a dark abyss. The organization of this bag is fantastic. It has more pockets and pouches than I know what to do with (for the record: 14 > my needs). I even opted for the extra nylon pocket that gets sewn along the back so I'm set. I just need to stop stuffing more crap in all those little extra spaces! Now as practical as the messenger sounds, there are some downfalls to it. For starters, there are no outer pockets, which would be great because its second negative point goes to its LOUD Velcro closure. Buckles would've been nicer, quicker and better for opening the bag without alerting the entire hemisphere, but eh, I'm looking at it as a pickpocket deterrent. But despite these details, the bag seems to work very well for me (Timbuk2's are known for great customer service and durability). Oh, and something should be said for their humor. The San Francisco-based company delighted me with their random snark from the order summary e-mail ("We suggest that you actually read it and like it because this is what you are getting and the Lucky One's address below is where we are going to send it. If you must be That Person, we can TRY our best to make changes or cancel your order.) to the reusable bag I received with a San Fran bike map printed on one side ("Make it into a bike seat cover, or a really small blanket or turn it into a smaller bag; whatever you do, stop kicking mother nature in the nads and don't throw this bag away!). The cherry on top? Discovering that the little tag inside says "quality $#!t since 1989." Well, it sounds like quite a nice bag. I hope you're happy with it and it meets you needs. 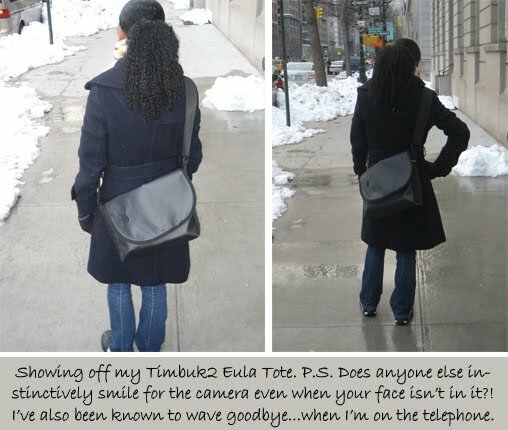 Any bag looks nice with you standing there smiling while you model it!